A whole heck of a while back I posted about our plans to spruce up the front porch. Nearly a year later we're still working on it. But that's real life, right? Spending money and doing work is spread over a much longer time period than what most of us would like. But I think it's better that way. The planning and collecting over time is pretty darn fun. Dingy, dirty and a total mismatch of furniture. Somehow leaves always collect in the corners of the porch along with our donations for Goodwill/ReStore (you're probably assuming that crazy table got donated - I actually painted it and brought it inside, which you can see here). 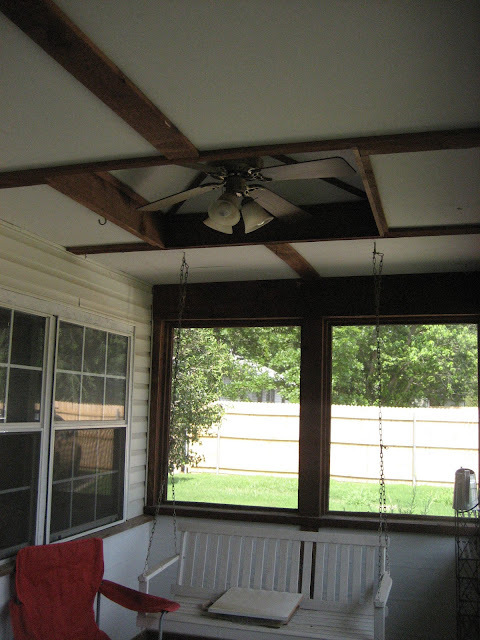 So last year we decided to start "The Porch Makeover 2011" which unfortunately has turned into "The Porch Makeover of 2012." 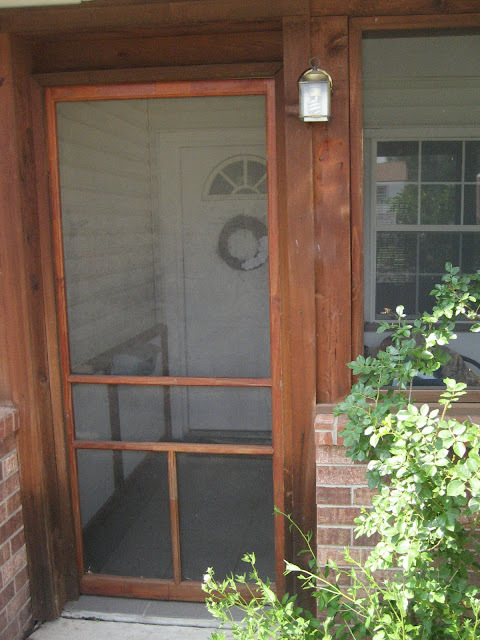 In this post I showed you how we painted the front door and changed out a light fixture. You gotta start somewhere. Unfortunately the makeover didn't get much further than that. Then this past spring we decided to give it another go. We washed down all the siding, painted the insides of the porch a brighter white, painted the bench blue to match the door, and added a patio set from Target. It definitely looks MUCH better than the before, but it's still not as inviting and colorful as I had envisioned. I'm having a tough time deciding exactly what to do in this room, but I'm hoping that whatever it is won't take me another year. Do you have any areas of your house that seem to take forever to decorate? Am I the only person who feel like their home is never "done?" so pretty! i love the blue swing! Mmm, look at that spiffy, cozy front porch that you guys have!!! You should put some indoor plants, I think it'd look pretty. I love those bright blue accents. They make everything look so cheery! I hate wind chimes! So maybe everything else that Anonymous suggested, but wind chimes are just noise pollution. Looks good! I love the blue swing. You can add some pillows on there for an extra pop of color and invitingness. You could sew some colorful pillow to put on the chairs! It's looking good though! Oh my goodness, I love your house! I know this is an old post but I love craftsman style houses! And that porch, I so want a sitting porch!